The way that the slacker pop of Dinosaur Jr. et al has crept back into pop has been heart-warming, to say the least. It shouldn’t, however, be too surprising, as the reappearance of the inaccurate but somehow more satisfying sounds of these bands is just part of a logical progression. Really, it’s just the next step from the uptight, mono-rhythmicality of the bands that followed in the Strokes’ wake: bands that were all style and little function, where super-precise drum beats and accurate guitar playing were desired ahead of song quality. So bands like Daily Life, where a warm fuzz not only swaddles each song – but necessarily smooths over some of the equally necessary rough edges – can be viewed as the woozy comedown from those dubiously cool times. Reunion, along with the band’s other songs, confirm their dedication to their non-posturing, not-too-cool-for-school remit. Their songs are dizzy and blurry and warm. 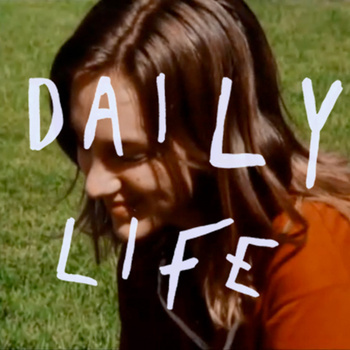 Daily Life spawned from another ANBAD-featured band, Hyacinth Girl. I noted in their review that they sounded a bit like Dinosaur Jr., too. Funny that. Here, in Daily Life, that trait continues, and yet this band have refined that sound, which now simmers between lackadaisical pop and crunchy de-tuned rock. They’re a low-key, end-of-the-party, sunsets-and-cold-beer kind of band. This is a very good thing. Posted on April 7, 2011 by Joe Sparrow. This entry was posted in Headline, Today's New Band and tagged lo-fi. Bookmark the permalink.